In a time when war heroes were accorded the glamour of Hollywood stars, retired U.S. Air Force Colonel James K. Johnson stood shoulder to shoulder with some of America's greats. The hallways of his Henderson home show him laughing with President Eisenhower. He's also pictured in the elite company of fliers known as Double Jet Aces, whose exploits include 10 or more kills in battle. 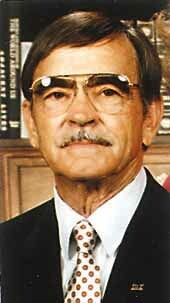 Johnson, who died Friday at age 81, began his military career with the U.S. Army Air Corps in 1939 and served twice as commander for what is now Nellis Air Force Base. His first stint was a brief one -- 25 days in 1946 while the property still belonged to the Army. He took charge again from September 1951 to October 1952. When Johnson married his wife, Sylvia, in 1979, U.S. statesman Barry Goldwater was his best man. His exploits during the Korean War prompted Stars and Stripes to dub the F-86 pilot "The Mayor of Sabre Jet City," and his unit, the 4th Fighter-Interceptor Wing of the 5th Air Force, was personally honored by former South Korean President Syngman Rhee with a citation. "Men like my father afforded us the freedom and the lifestyle we know today," his son, James Johnson Jr. said. "It it weren't for those men doing what they did, we wouldn't be sitting here today." His father died after a prolonged battle with cancer. His funeral will be 4 p.m. Wednesday in the chapel at Nellis. No visitation will be held. He will be buried at Arlington National Cemetery in Washington, D.C. His wife asks that donations in Johnson's name be made to the American Cancer Society. Johnson is survived by wife, Sylvia; a brother, George of Phoenix; five daughters, Jay Johnson and Patricia Richert of Phoenix, Peggy Good of Arlington, Va., Judith McCown of Virginia and Sherri Becker of Cary, N.C.; a son, James Jr.; four grandchildren; and two great-grandchildren. "He was a professional," said retired Air Force Colonel Robert Hubbard, who served with Johnson. "He was very steady, very cool and could be compassionate when the men needed him to be." 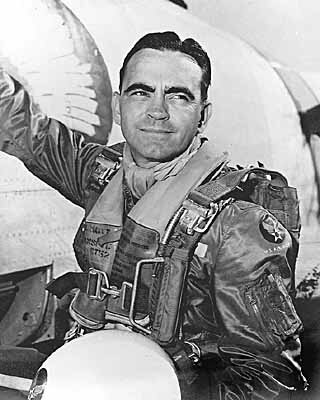 Even though Johnson retired from the service in 1963, his role in the fledgling age of jet combat earned him a steady stream of fan mail from aviation buffs. Truett Guthrie of Hobart, Oklahoma, saw Johnson featured on the History Channel program, "Most Decorated: Aces of the Korean War." "My heroes were guys like yourself," wrote Guthrie of his coming of age in the 1950s. "Thank you for your service to our country and for being a hero to countless Americans like myself." Johnson's commendations include the Distinguished Service Cross, a silver star with an oak-leaf cluster, the Legion of Merit with an oak-leaf cluster, and the Air Medal with three silver and three oak-leaf clusters. "It comes from all over the world, every week," Sylvia Johnson said. "He answered as many as he could."